For the common European species of mugwort, see Artemisia vulgaris. Mugwort is a common name for several species of aromatic plants in the genus Artemisia. In Europe, mugwort most often refers to the species Artemisia vulgaris, or common mugwort. While other species are sometimes referred to by more specific common names, they may be called simply "mugwort" in many contexts. The Anglo-Saxon Nine Herbs Charm mentions mucgwyrt. 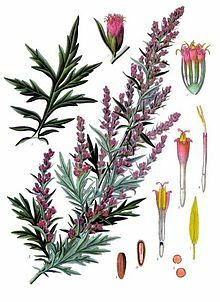 A folk etymology, based on coincidental sounds, derives mugwort from the word "mug"; more certainly, it has been used in flavoring drinks at least since the early Iron Age. Other sources say mugwort is derived from the Old Norse muggi (meaning "marsh") and Germanic wuertz (wort in English, originally meaning "root"), which refers to its use since ancient times to repel insects, especially moths. The Old English word for mugwort is mucgwyrt where mucg-, could be a variation of the Old English word for "midge": mycg. Wort comes from the Old English wyrt (root/herb/plant), which is related to the Old High German wurz (root) and the Old Norse urt (plant). Artemisia princeps – Japanese mugwort (yomogi), Korean mugwort (ssuk), used as a culinary herb and in traditional Chinese medicine. Mugwort oil contains thujone, which is toxic in large amounts or under prolonged intake. Thujone is also present in Thuja plicata (western red cedar), from which the name is derived. The downy hairs on the underside of the leaves can be scraped off and used as effective tinder. All parts of the plant contain essential oils with all-purpose insecticidal properties (especially in the killing of insect larvae). This is best used in a weak infusion, but use on garden plants is not recommended, as it also reduces plant growth. Mugwort is a powerful flower that has been used for therapeutic uses to relieve sleepiness. The leaves and buds, best picked shortly before mugwort flowers in July to September, were used[by whom?] as a bitter flavoring agent to season fat, meat and fish. Mugwort has also been used to flavor beer before the introduction of hops. The composition of Mugwort essential oil can vary depending on the genus of plant selected, its habitat, as well as the part of the plant extracted and the season of its harvest. Its main components can include camphor, cineole, α- and β-thujone, artemisia ketone (CAS: 546-49-6), borneol and bornyl acetate as well as a wide variety of other phenols, terpenes and aliphatic compounds. In the European Middle Ages, mugwort was used as a magical protective herb. Mugwort was used to repel insects – especially moths – from gardens. Mugwort has also been used from ancient times as a remedy against fatigue and to protect travelers against evil spirits and wild animals. Roman soldiers put mugwort in their sandals to protect their feet against fatigue. Mugwort is one of the nine herbs invoked in the pagan Anglo-Saxon Nine Herbs Charm, recorded in the 10th century in the Lacnunga. Grieve's Modern Herbal (1931) states that "in the Middle Ages, the plant was known as cingulum Sancti Johannis, it being believed that John the Baptist wore a girdle of it in the wilderness...a crown made from its sprays was worn on St. John's Eve to gain security from evil possession, and in Holland and Germany one of its names is 'St. John's plant', because of the belief that – if gathered on St. John's Eve – it gave protection against diseases and misfortunes." In the Isle of Man, mugwort is known as bollan bane, and is still worn on the lapel at the Tynwald Day celebrations, which also have strong associations with St John. There are several references to the Chinese using mugwort in cuisine. The famous Chinese poet Sū Shì in the 11th century mentioned it in one of his poems. There are even older poems and songs that can be tracked back to 3 BC. It was often called lóuhāo (蒌蒿) or àicǎo (艾草) in Mandarin. Mugwort can be prepared as a cold dish or can be stir-fried with fresh or smoked meat. The Hakka Taiwanese also use it to make chhú-khak-ké (鼠麹粿), doughy sweet dumplings. Mugwort is also used as a flavoring and colorant for a seasonal rice dish. In traditional Chinese medicine, mugwort is used in a pulverized and aged form – called moxa in English (from Japanese mogusa) – to perform moxibustion, that is, to burn on specific acupuncture points on the patient's body to achieve therapeutic effects. In Germany, known as Beifuß, it is mainly used to season goose, especially the roast goose traditionally eaten for Christmas. Mugwort – or yomogi (蓬) – is used in a number of Japanese dishes, including yōkan, a dessert, or kusa mochi, also known as yomogi mochi. Mugwort rice cakes, or kusa mochi are used for Japanese sweets called daifuku (literally 'great luck'). To make these, take a small amount of mochi and stuff it or wrap it round a filling of fruit or sweetened adzuki (red bean) paste. Traditional daifuku can be pale green, white or pale pink and are covered in a fine layer of potato starch to prevent sticking. Mugwort is a vital ingredient of kusa mochi (rice cake with mugwort) and hishi mochi (lozenge rice cake), which is served at the Doll Festival in March. In addition, the fuzz on the underside of the mugwort leaves is gathered and used in moxibustion. In some regions in Japan, there is an ancient custom of hanging yomogi and iris leaves together outside homes in order to keep evil spirits away. It is said that evil spirits dislike their smell. The juice is said to be effective at stopping bleeding, lowering fevers and purging the stomach of impurities. It can also be boiled and taken to relieve colds and coughs. In both North and South Korea, mugwort – ssuk (쑥) – is used in soups and salads. A traditional soup containing mugwort and clams is ssukguk (쑥국), made in spring from the young plants just before they bloom. Another dish is named ssukbeomul (쑥버물), in which the mugwort is mixed with rice flour, sugar, salt and water and is then steamed. It is a common ingredient in rice cakes, teas, soups, and pancakes. Known as a blood cleanser, it is believed to have different medicinal properties depending on the region it is collected in. In some regions, mugwort thins the blood, while in another region, it is claimed to have hallucinogenic properties, causing some to pass out from direct skin contact (dermal absorption) with the active chemicals. For this reason, some Koreans also wear a silk sleeve when picking mugwort plants. Its primary use, however, is in moxibustion. Mugwort is burned on pressure points of the body, much like acupuncture. Mugwort pollen is one of the main sources of hay fever and allergic asthma in North Europe, North America and parts of Asia. Mugwort pollen generally travels less than 2,000 meters. The highest concentration of mugwort pollen is generally found between 9 and 11 am. The Finnish allergy association recommends tearing as a method of eradicating mugwort. Tearing mugwort is known to lessen the effect of the allergy, since the pollen flies only a short distance. The mugwort plant has been used as an anthelminthic, so it is sometimes confused with wormwood (Artemisia absinthium). The plant, called nāgadamanī in Sanskrit, is used in Ayurveda for cardiac complaints as well as feelings of unease, unwellness, and general malaise. In traditional Chinese medicine, there is a belief that moxibustion of mugwort is effective at increasing the cephalic positioning of fetuses who were in a breech position before the intervention. A Cochrane review in 2012 found that moxibustion may be beneficial in reducing the need for ECV, but stressed a need for well-designed randomised controlled trials to evaluate this usage. Mugworts are used medicinally, especially in Chinese, Japanese, and Korean traditional medicine. 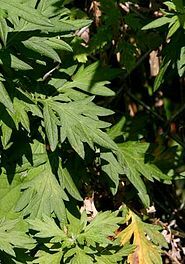 One species, Artemisia argyi, is often called "mugwort" in the context of traditional Chinese medicine, or more specifically "Chinese mugwort", or àicǎo (艾草) in Mandarin. Artemisia princeps is Korean mugwort, known locally as ssuk (쑥). It is also found in Japan, where it is known as yomogi (ヨモギ). Epazote, a plant with a similar flavour profile used in North and South American cuisines. ^ a b Edwards, Lin (17 January 2011). "Brewery from 500 BC reveals its secrets". Archeology & Fossils. Physics News. doi:10.1007/s12520-010-0049-5. Retrieved 17 January 2011. ^ Lust, J. (2005) The Herb Book 604. ^ Johnson. C. P. The Useful Plants of Great Britain. ^ Allardice.P. A - Z of Companion Planting. ^ Riotte. L. Companion Planting for Successful Gardening. ^ Sarah., Raven, (2011). Wild flowers. Buckley, Jonathan. London: Bloomsbury. ISBN 9781408813942. OCLC 756273214. ^ "A Historical Dictionary of the World's Plant Foods: M-Q." Cambridge World History of Food, edited by Kenneth F. Kiple and Kriemhild Conee Ornelas, vol. 2, Cambridge University Press, 2000, pp. 1804-1841. Gale Virtual Reference Library, http://link.galegroup.com.erl.lib.byu.edu/apps/doc/CX3450400202/GVRL?u=byuprovo&sid=GVRL&xid=7f5cc15a. Accessed 3 Dec. 2018. ^ Abad, María José; Bedoya, Luis Miguel; Apaza, Luis; Bermejo, Paulina (2 March 2012). "The Artemisia L. Genus: A Review of Bioactive Essential Oils". Molecules. 17 (12): 2542–2566. doi:10.3390/molecules17032542. ^ Wright, Colin, Ed. (2002). Artemisia. London; New York: Taylor & Francis. p. 144. ISBN 0-415-27212-2. ^ Stephen Pollington "Leechcraft: Early English Charms, Plantlore and Healing"
^ Grieve, Maud (1971). A Modern Herbal: The Medicinal, Culinary, Cosmetic and Economic Properties, Cultivation and Folk-lore of Herbs, Grasses, Fungi, Shrubs, & Trees with All Their Modern Scientific Uses, Volume 2. ^ "A Bite of China: The Story of Staple Food" (in Chinese). Retrieved 20 February 2013. ^ Kamaneko@msn.com, KAMANEKO WORKSHOP K.Okaeda. "YOMOGI". www.shejapan.com. Retrieved 29 June 2017. ^ "Sign In". PMID 12475905. Retrieved 29 June 2017. ^ Ramawat, K. G., Ed. (2004). Biotechnology of Medicinal Plants: Vitalizer and Therapeutic Enfield, New Hampshire: Science Publishers, Inc. 5. ^ Coyle ME, Smith CA, Peat B (2012). "Cephalic version by moxibustion for breech presentation". Cochrane Database Syst Rev. 5: CD003928. doi:10.1002/14651858.CD003928.pub3. PMID 22592693. ^ "English Names for Korean Native Plants" (PDF). Archived from the original (PDF) on 25 May 2017.